UPDATE: Police have confirmed that the search for a missing elderly man in Cherokee County has been called off. No further details have been released. CANTON, Ga. -- The Cherokee County Sheriff's Office needs the public's help finding a missing 73-year-old man. Clyde Dean Welch was last seen on Friday at around 5 a.m. in the 200 block of Serenoa Drive in Canton, Ga.
Family believes he may be heading to Michigan in his Maroon 2008 Chevrolet Impala. It has a Michigan tag that reads CML7420. Welch has several health conditions including diabetes, heart failure and possible dementia. Officials said he left home without his dentures and prescription medications. Welch is described as about 5 feet 5 inches tall and weighs about 150 pounds. He had blue eyes brown and grey hair and a long beard. CHEROKEE COUNTY, Ga. -- An inmate in the Cherokee County Adult Detention Center died Monday. Bobby Kilgore, 71, of Palmetto was arrested June 6 on a probation violation charge. He had a condition that caused him to be housed in the jail's medical unit. The Cherokee County Sheriff's Office said Kilgore was under the care of the jail's medical staff when he passed away. An autopsy is scheduled for Tuesday at the GBI Crime Lab. The GBI will also investigate, as it does with every inmate death. CHEROKEE COUNTY, Ga. -- Investigators from several agencies worked together to arrest two women on drug-related charges in Cherokee County. Katherine Silva, 25, was taken into custody June 3 after selling heroin to an undercover Cherokee Multi-Agency Narcotics Squad (CMANS) agent. Silva was in possession of more than six grams of heroin, according to CMANS Commander Phil Price. Agents began investigating Silva after receiving information that she was a source of heroin in southern Cherokee County. She has been charged with trafficking, one of Georgia's most serious drug charges, and is being held without bond in the Cherokee County Adult Detention Center. 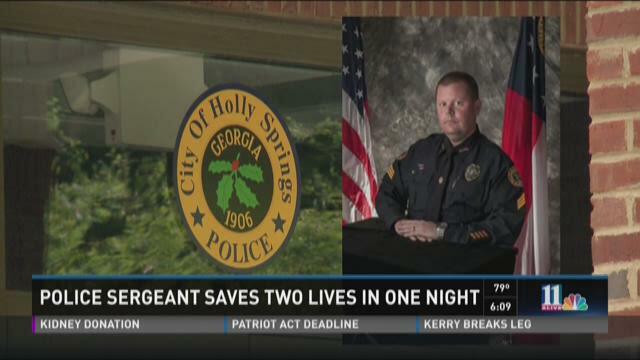 HOLLY SPRINGS, Ga. -- One Holly Springs Police Sergeant earned his keep Saturday night saving two lives during one shift. Ronnie Callahan stepped out onto his Holly Springs porch Saturday night. "I've never had a feeling like that when I come out on that porch," said Ronnie Callahan, homeowner. Down the hill he could see flames. "Seeing that fire, knowing their situation," said Callahan. They poured from the house where his disabled sister and elderly mother slept. "I couldn't even dial 911," said Callahan. CANTON, Ga. --Two months ago, Georgia passed a controversial and life-changing law for some families in need of medical marijuana. Corey Lowe's daughter Victoria was one of the first people in the state to receive a temporary permit to use it. Victoria suffers from mitochondrial disease and an incredible number of seizures, but Lowe said cannabis oil helps. "She would have 50 a day, 50 to 100 a day, before cannabis oil -- gut wrenching," said Corey Lowe. Lowe said she tried everything -- dozens of drugs, any kind of medicine she could get her hands on -- but it didn't work. "They couldn't get her seizures to stop," said Lowe. That's when she decided to pack up and take Victoria to Colorado, where she could legally use cannabis oil. They left the rest of their family behind. CANTON, Ga. -- McPal Inc., a franchisee of McDonald's, has reached a settlement agreement with the U.S. Attorney's Office after an investigation into a north Georgia restaurant. According to a complaint, a manager at a Canton McDonald's refused to allow a customer to bring her son's service dog into the building. The manager's actions violated Title III of the Americans with Disabilities Act, which requires private businesses like restaurants to allow service animals in all areas where the public is allowed to go. "This settlement agreement ensures that those who are assisted by service animals will enjoy the same service as all citizens, and we hope it ensures that the same will occur at other restaurants as well," Acting U.S. Attorney John Horn said in a release. CANTON, Ga. -- A 62-year-old man with dementia who went missing Sunday has been found safe in Cherokee County. Steven Pendergast of Dallas, Ga. was last seen at about 6:30 p.m., Sunday afternoon at Payne Campground off of Kellogg Creek Road. Public safety officials found him in the woods near a Boy Scout camp, not far from where he went missing. He was checked out by paramedics and then reunited with his family.